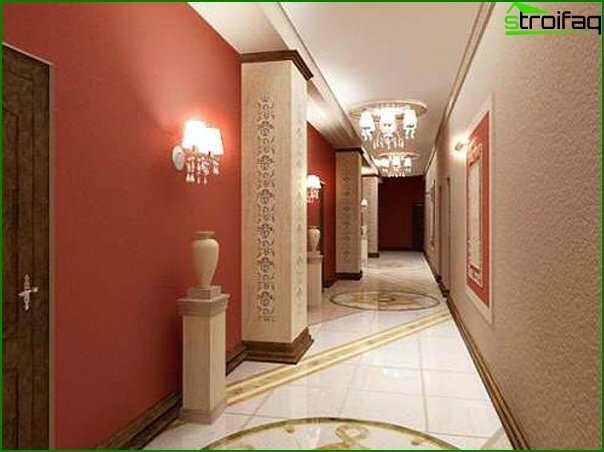 Find out which design is more suitable for your hallway! 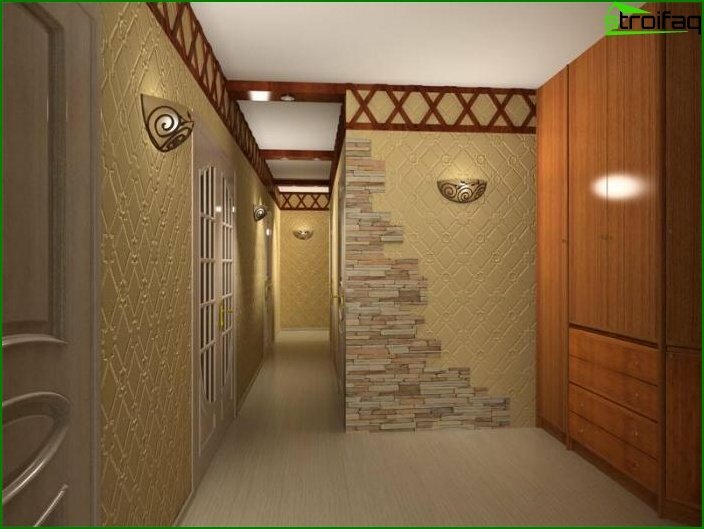 We help to choose the design of the hallway in the apartment. 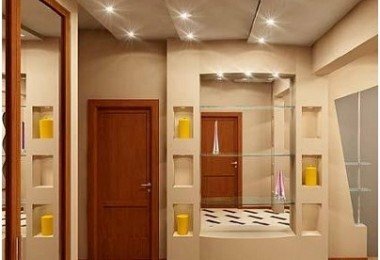 Photos of the best ideas for the interior of the corridor. 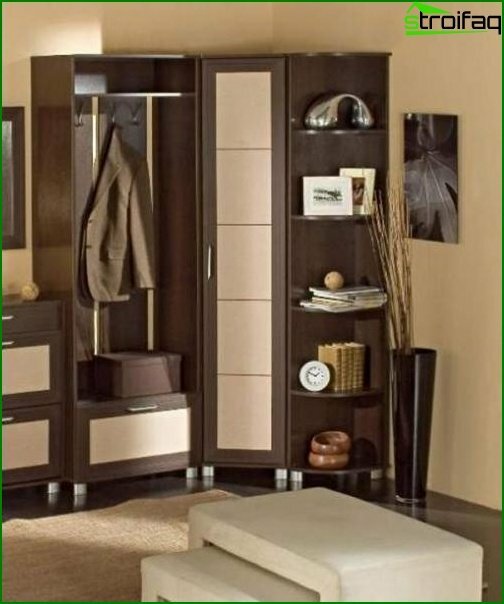 How to combine the desire of the owner in the hallwayShow your taste, possibilities, and put all the necessary things there? 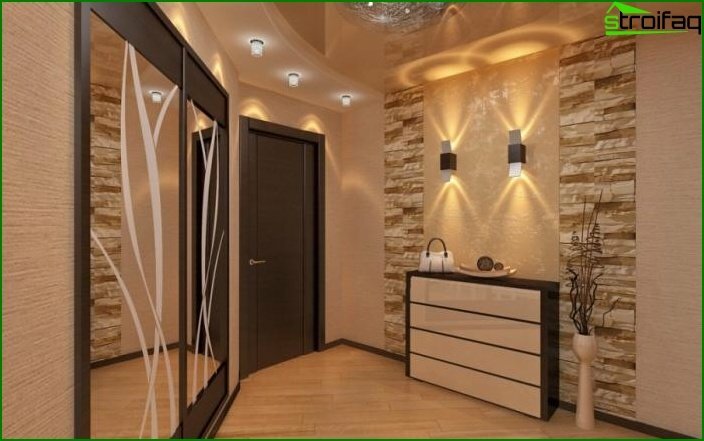 After all, the hallway is the first room in which the guest comes, her appearance should be presentable. 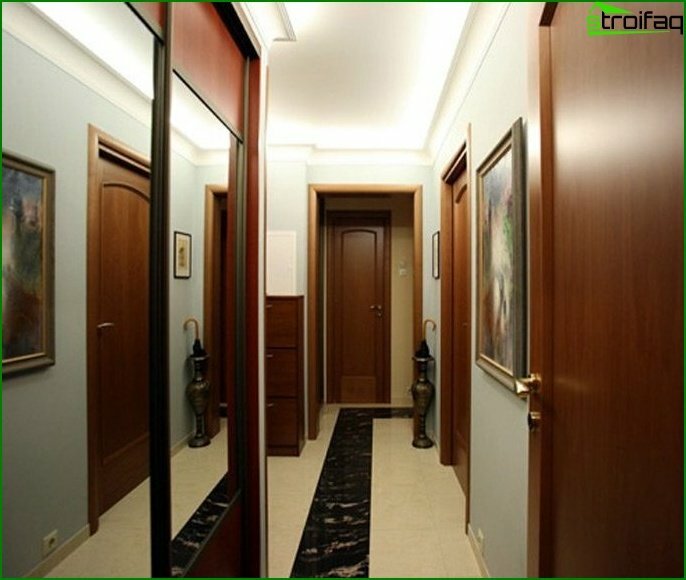 The problem may seem complicated, especially since not every hallway has a large area. But even on a few squares you can create a real stylish room. And how to do this we will try to tell you in our article. 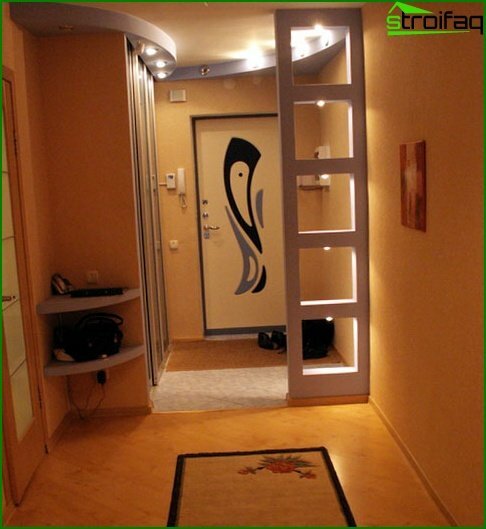 The style most acceptable for smallHallway, minimalism. Unfortunately, to prevent the premises from becoming a landfill, one must abandon the abundance of decor and hide things in the closet. 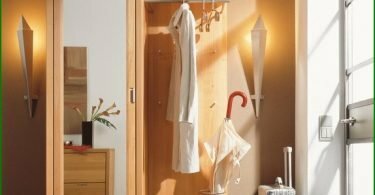 An open coat rack with a heap of clothes does not look aesthetically pleasing. It is best to put in a small hallwaycloset. All things will be collected in one place, safely hidden behind the sliding door. 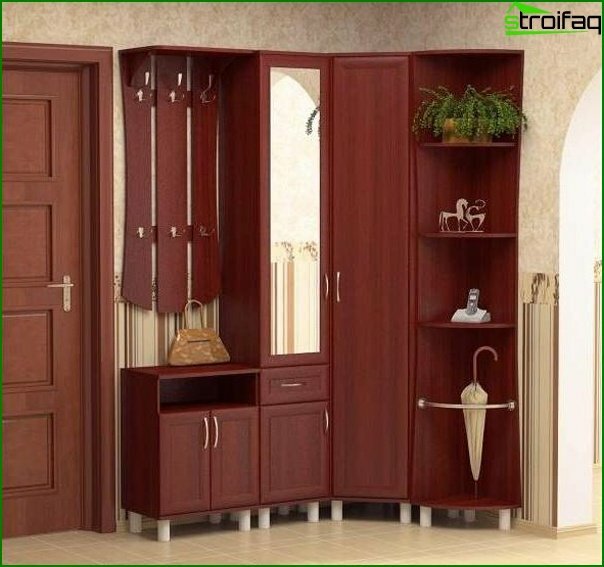 Thanks to the sliding door, even in the open, the cabinet will not take up unnecessary space. Moreover, the mirror in the door facade visually enlarges the space. Compact furniture. 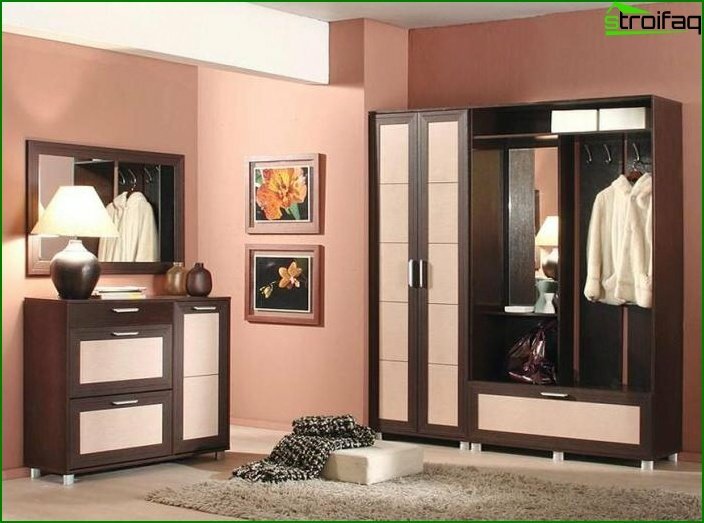 If the closet is unacceptable for some reason, it is better to put a standard wardrobe with hangers placed across it. This will make it possible to reduce its width to 45 centimeters. If the ceilings are high, then you can add mezzanines to the closet. 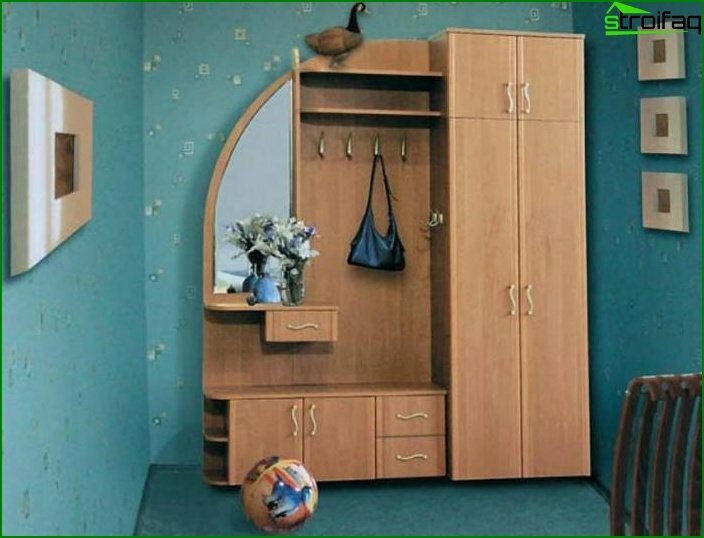 Corner cupboard. It takes a place that is usually empty - corners. At an apparent small size, it is very roomy and compact. 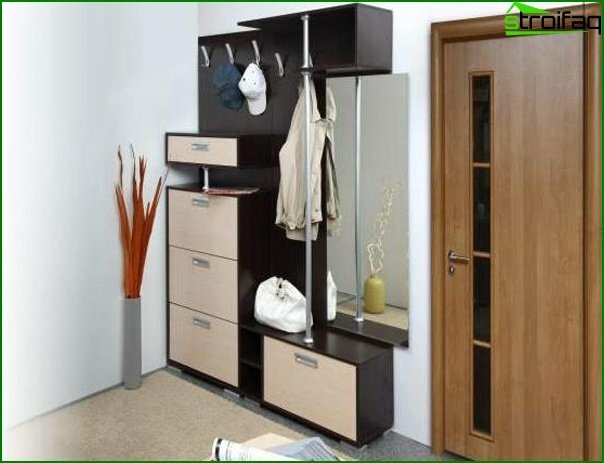 Shelf or chest of drawers for shoes. The shoes scattered on the floor in disorder do not create any aesthetic or functional comfort. 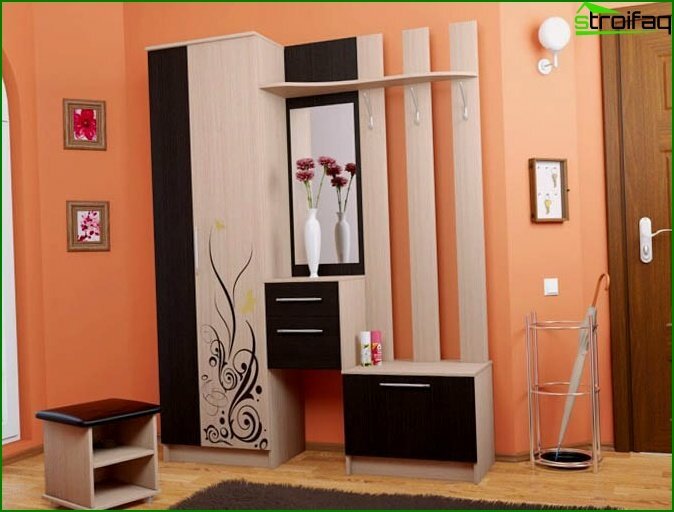 In addition, furniture for shoes can be made to order any width and height, taking into account its number. 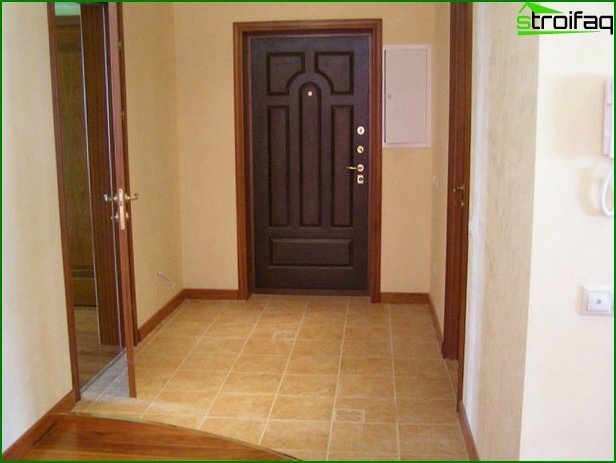 The interior door that opens into the hallway should not be made deaf. 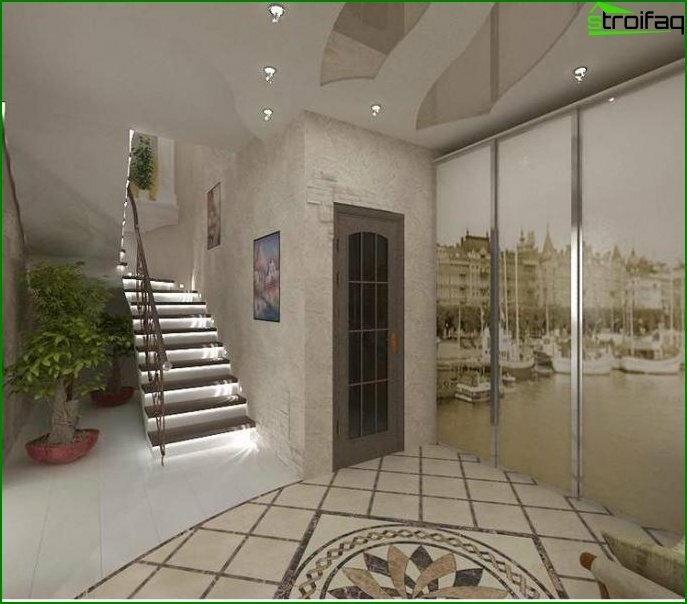 With a glass insert it will let light into the hall when closed, which will visually increase it. 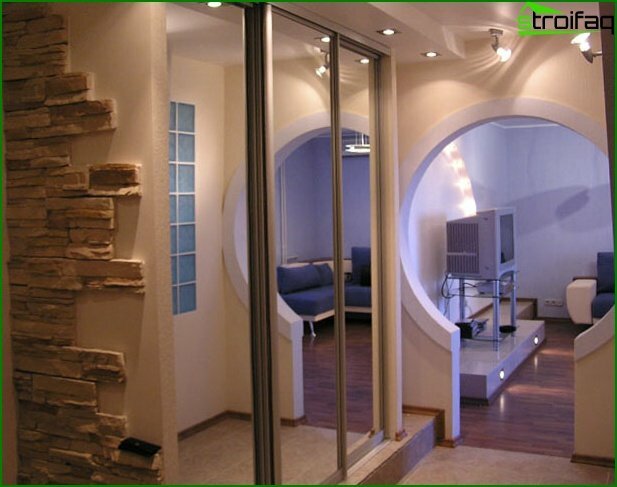 Walls and furniture in a small hallway should beLight. But do not overdo it with very light shades, wanting to visually increase the space - they will be visible any, even insignificant, dirt. Do not forget the importance of lighting. In the hallway there are usually no windows, there is no natural lighting. The lack of fixtures can make it smaller and darker. 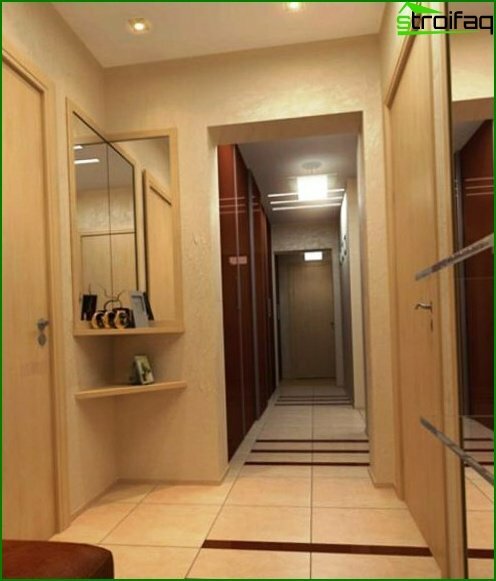 See more Photo of hallway design in a small corridor. 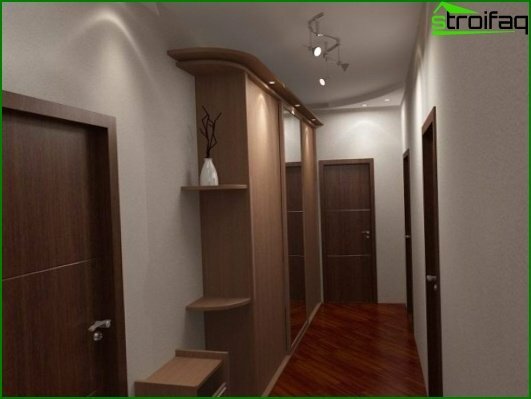 The problem of a narrow and long hallway is where and howPlace furniture. 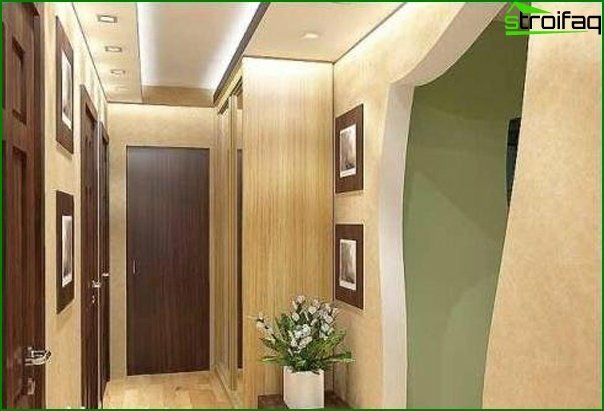 After all, in addition, how to place things more compactly, it is necessary to solve the task of smoothing a large difference in the size of the walls. 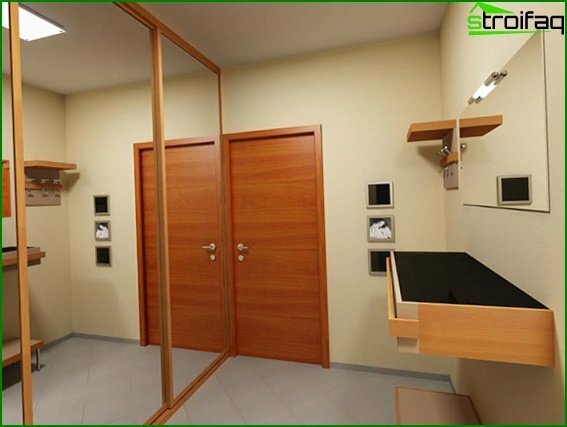 If the room is too long, then it can be zoned, dividing into place for clothes, shoes and a hall. 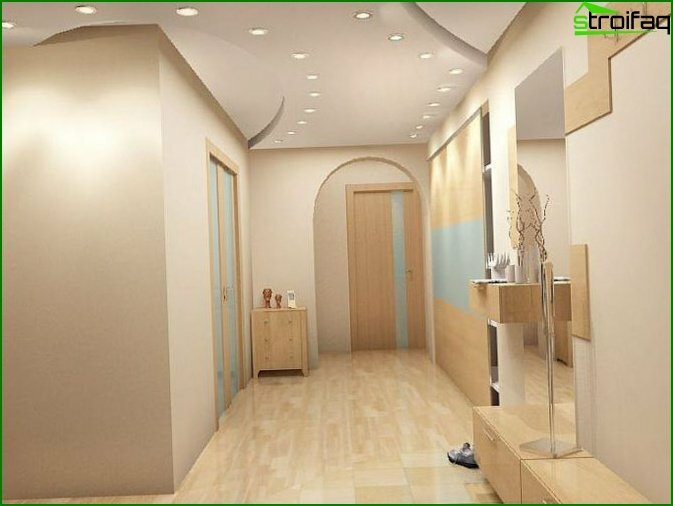 With this task are doing quite well Multi-level ceilings, Combined coating of floor and walls. 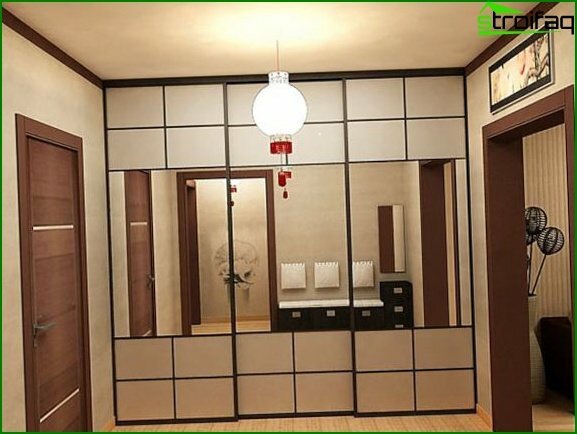 Visually increase the space will help mirrors,Which are located on longer walls, or wall-papers with a pronounced perspective. A good correction of the space of the long hallway is the absence of an interior door, when the doorway changes to an arch. You can align the rectangle using colorsolutions. Lighter tones on long walls move them apart, and dark shades on narrow ones bring closer, making the room square and pleasant for visual perception. To beat the length of the room can be lamps, placing them in the center, leaving the end walls in the penumbra. In the photo you can see a beautiful solution in the corner hallway. The advantage of the corner cabinet has long been appreciatedOwners of small rooms. This is the most rational use of space. To that you will be pleasantly surprised that besides clothes, shoes, umbrellas and hats there will fit a vacuum cleaner, a children's bicycle or a stroller. 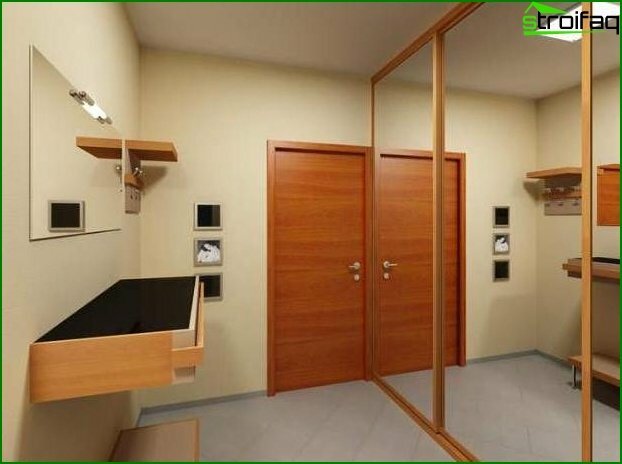 The facade decorated with a mirror will make such a roomy closet almost weightless and invisible even in a very small hallway. Designers recommend using a ladder inHallway with maximum effect. 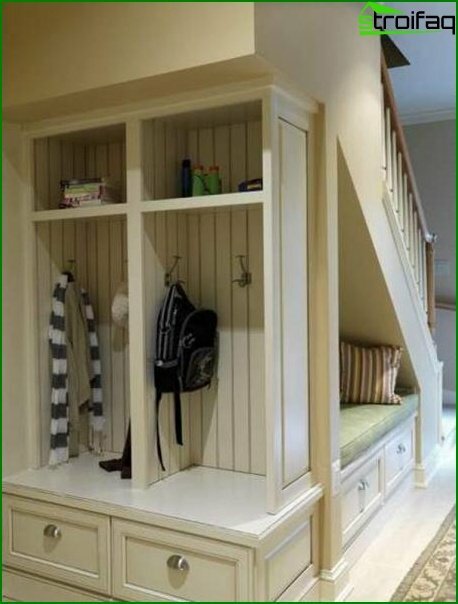 After all, there is so much unoccupied space under it where the shelves for shoes, umbrellas and hats, hangers for children's clothes and many other necessary trifles can fit. 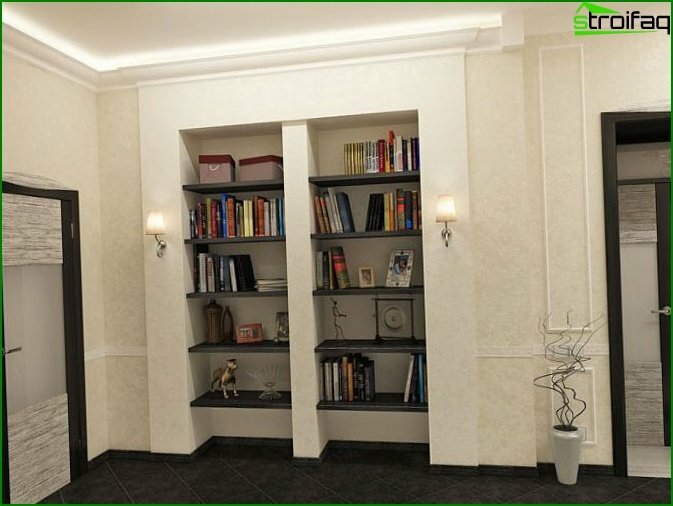 If the hallway Combined with living room, Then under the stairs you can place books or equipment, and, putting a cozy armchair with a floor lamp, spending time in seclusion with a book or favorite music. More Photo of stairs to the second floor. Choose the right color scheme. Furniture and walls should be fairly light, but not white in color, otherwise all dirt will be visible. 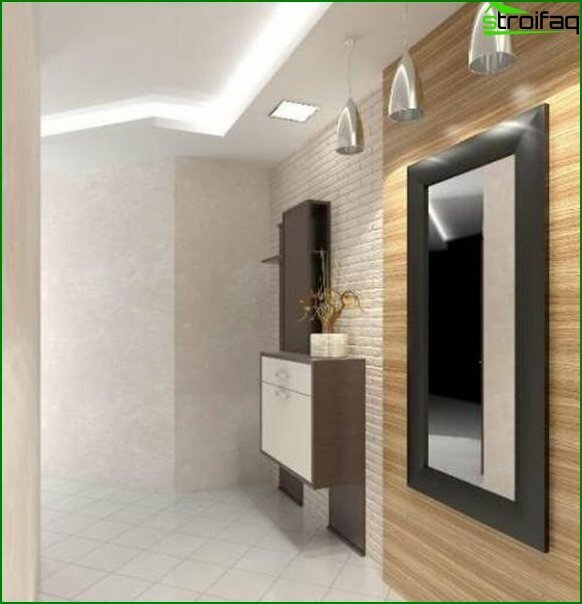 Use in the visual expansion of the space mirrors, glossy coating on the walls, stretch ceilings. 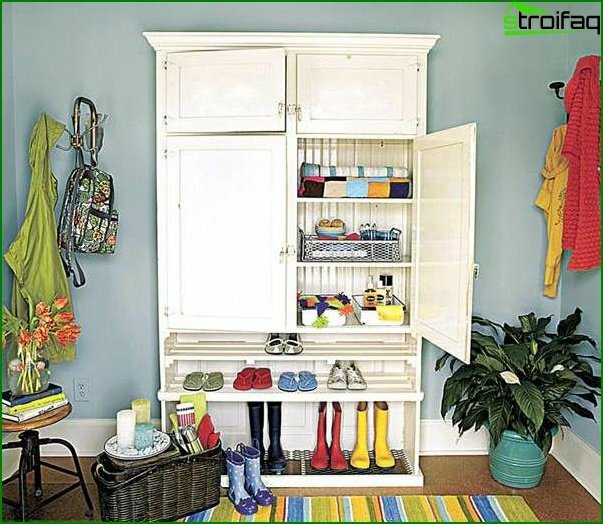 Use instead of cabinets small shelves and hooks for clothing. 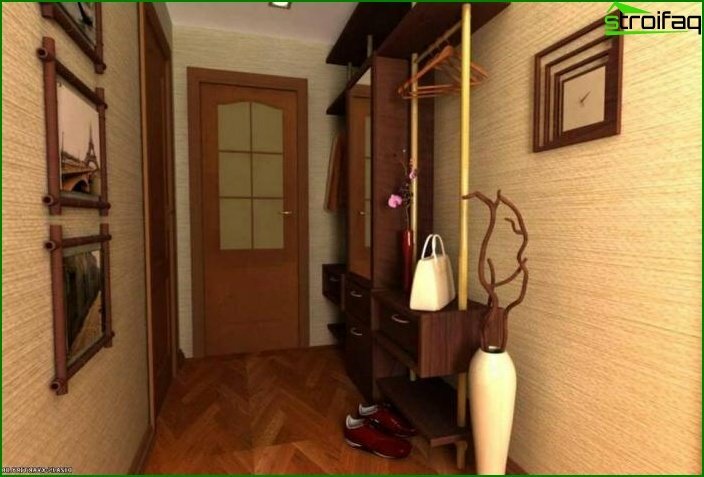 If the hallway is very long and not burdened Interroom door Closer to a narrow wall - you can place a closet next to it. Place under the ceiling mezzanine on the perimeter of the room. So that they do not look cumbersome, you can draw them from below with spotlights. A few point lights on the walls and ceiling. 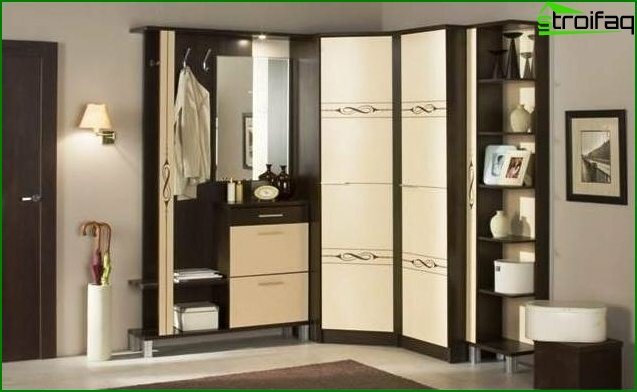 Most rooms are non-standard, built on an individual project - typical factory furniture for them, most likely, will not work. 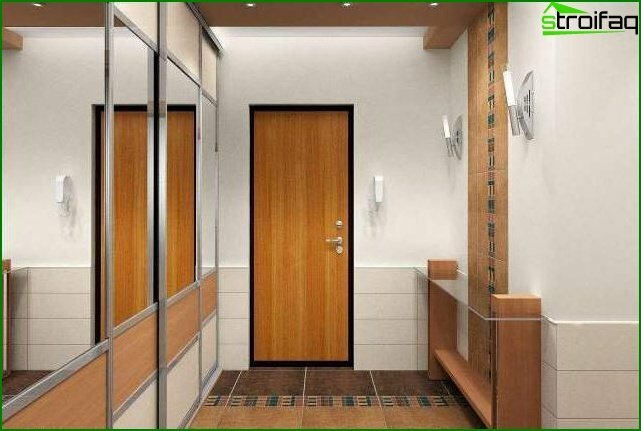 It is very important to consider the temperature in the hallway,After all its door leaves not in rather warm entrance in a high-rise building, and directly on street. 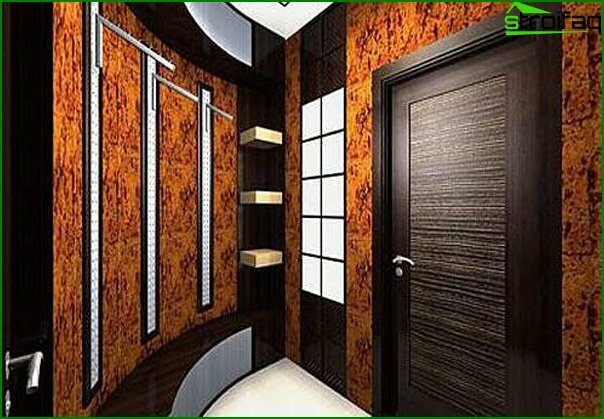 Because of this feature, builders advise not to install metal entrance doors or complement them with internal wooden ones. It is not recommended in hallway design to useMaterials that do not tolerate moisture: paper wallpaper, drywall. 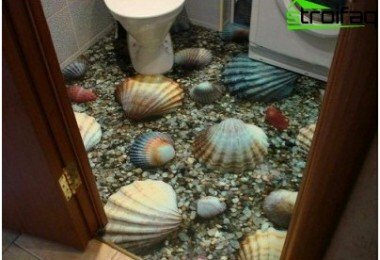 For a floor it is better to take a tile or linoleum. 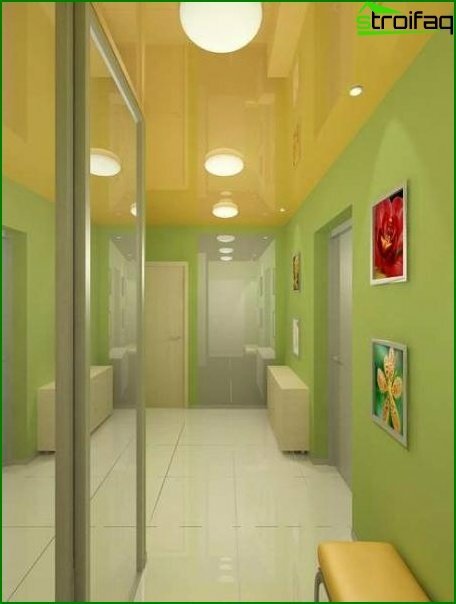 Cover the walls and ceilings with paint or plastic panels. Instead of cabinets and shelves for shoes made of wood and chipboard, it is better to use metal furniture and coasters. Very beautiful look shelves, a bench and a stand for umbrellas of wrought iron. 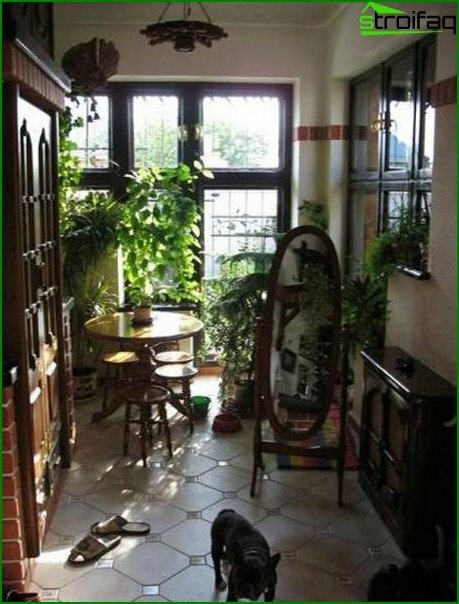 The entrance hall requires a detailed arrangement of at least a living room or kitchen. After all, it needs to accommodate a large number of things that are out of place in other rooms of the apartment. Functional where you can hide things and shoes. 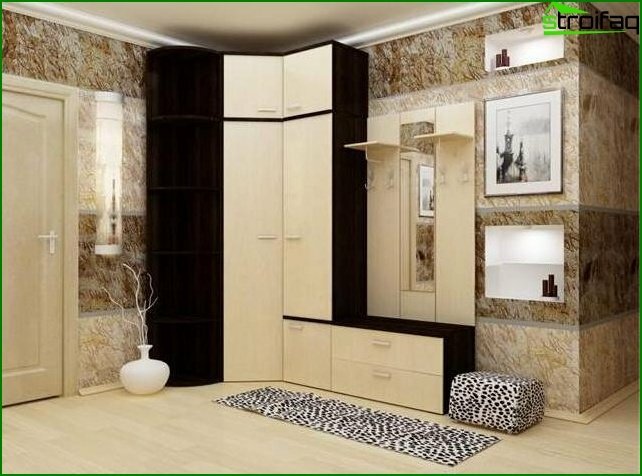 These are all kinds of curbstones, chests of drawers, built-in and cabinet cases, hinged shelves, shoe stores. Furniture for rest. These are all kinds of padded stools, benches, chairs or chairs. Auxiliary furniture. These are tables, shelves, where all the necessary things are in the vestibule: combs, keys, gloves. mirror. Although not a piece of furniture, it is very important in the hallway. 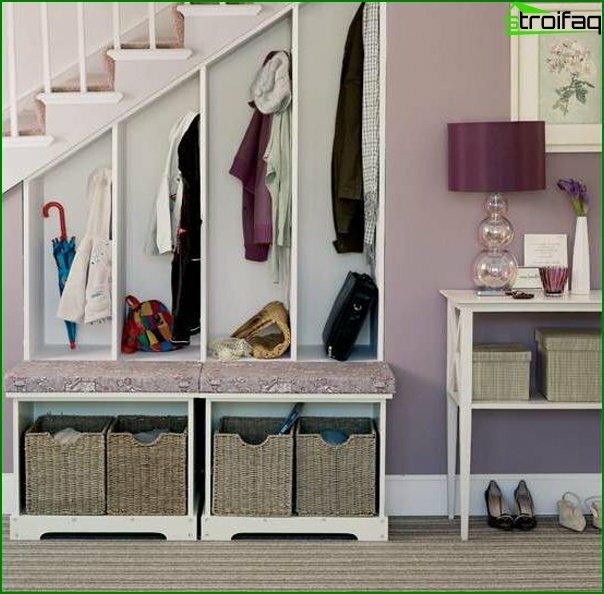 Sometimes a small hallway area does not allowPlace all these items. 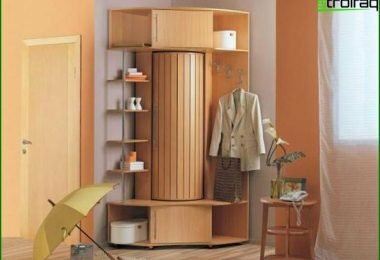 Then the design of objects is designed so that in one combine several functions: a shelf for shoes used as a chair, the cabinet door has a mirror surface. A perfect example of this multifunctionality are the corner cabinets. 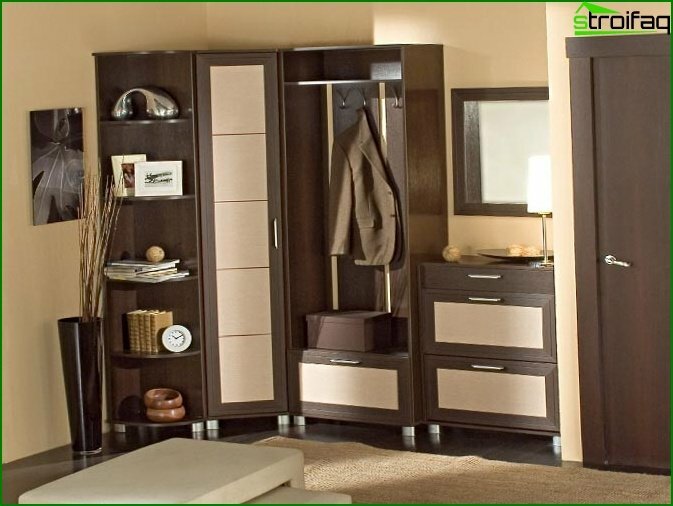 Increasing popularity of modular furnitureConsists in the fact that it is possible to compose furniture ensembles independently, acquiring only the necessary modules. 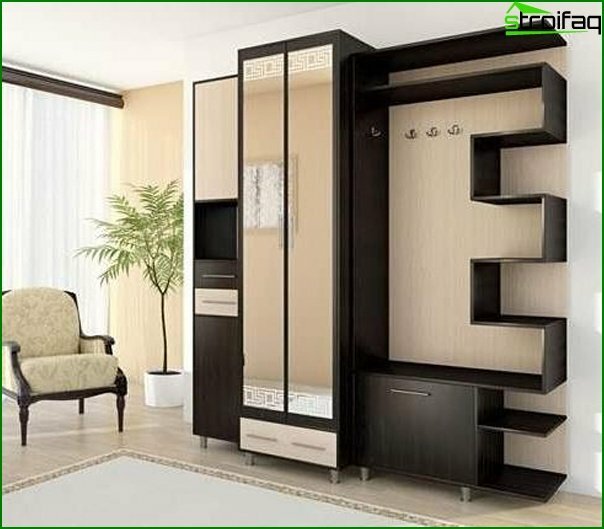 After all, when we did not have a choice, we bought standard furniture, sometimes not suitable in size or with superfluous functional elements. Now, thanks to modular furniture, we canTo equip their premises as comfortable as possible, not guided by the point of view of the developers of cabinet furniture. Moreover, modular division is advantageous in that it is possible to acquire each element of a future completed ensemble at a convenient time without taking up the money for a full set of months, living in inconveniences. 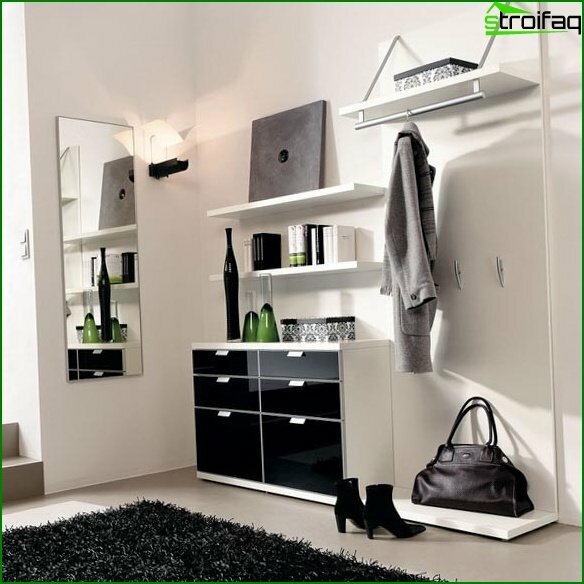 In addition, what aesthetic pleasure fromModular furniture - because it can be rearranged, swapped, creating a completely new interior. 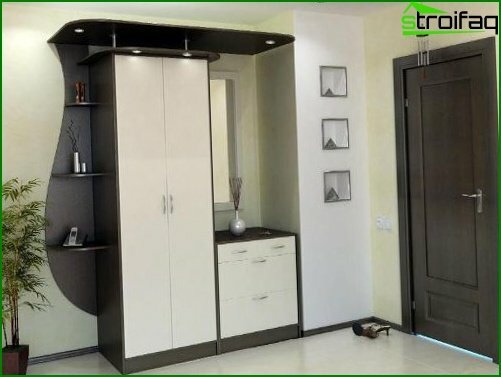 The owners of small hallways, in order to save money and not buy furniture that does not fit in the room or too cluttered it, can buy it gradually, installing in turn and deciding whether there is still something. And the minimum set of furniture needed for the hallway was specified in the previous section. 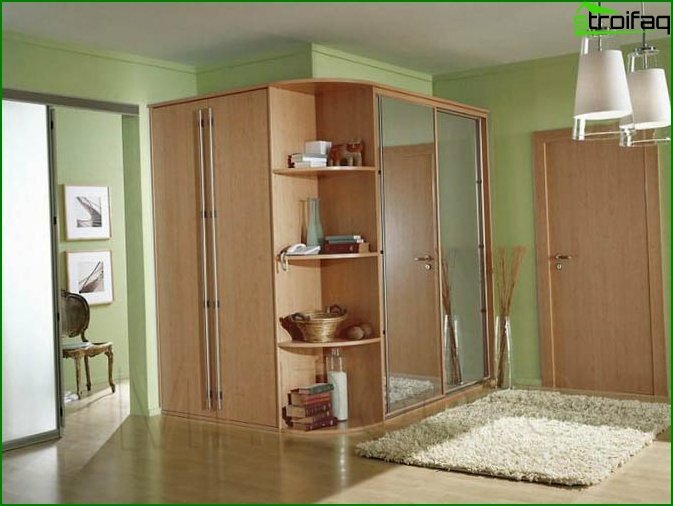 It has already become customary in the sliding doors of the sliding-door wardrobePlace a mirror cloth. 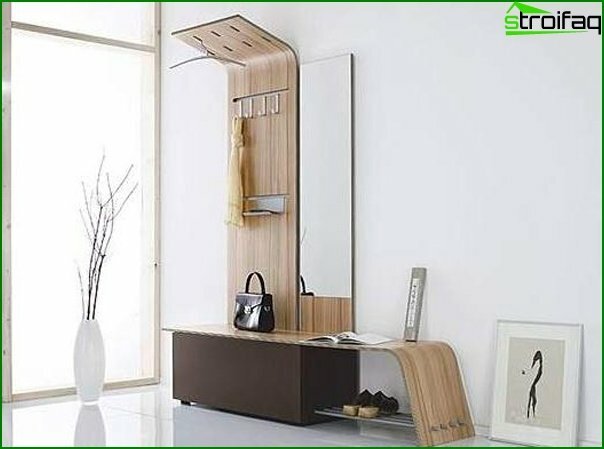 Thanks to this, furniture becomes multifunctional, which is important for small areas of the premises. 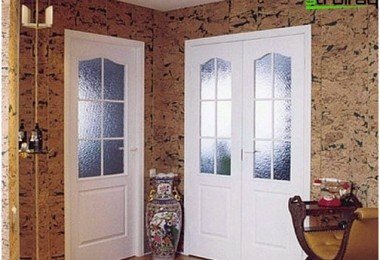 Otherwise, you can use chipboard or frosted glass with all sorts of drawings. 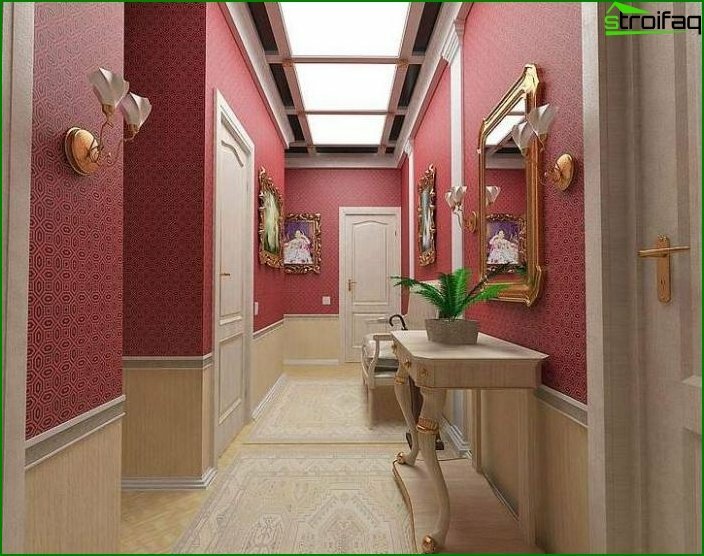 Now the furniture makers apply the application to the doors of various prints, which not only successfully makes the original hallway, but also visually changes the space. 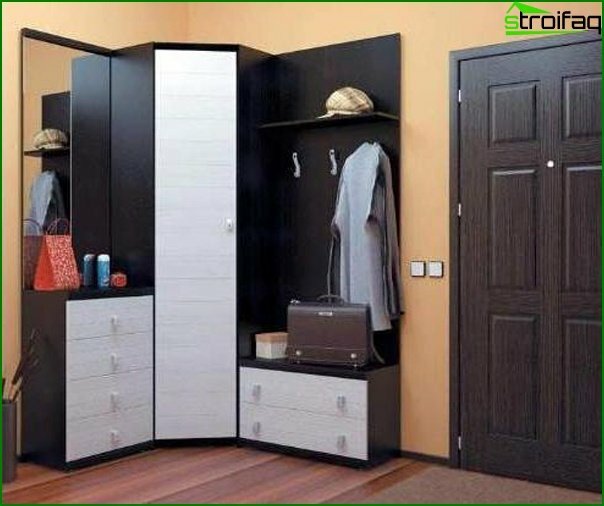 Look at the nuances of choosing a wardrobe for the hallway in a separate material. Hall - the first room in the house where there isDirty shoes from the street, rain-fed umbrellas and raincoats. 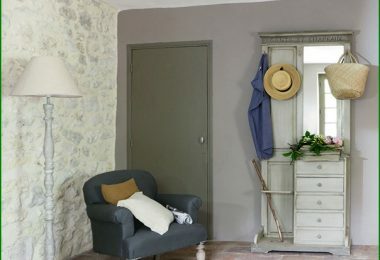 And because the wallpaper in the hallway must choose the appropriate - not very light, easy to wash or For painting. The ideal option for price and quality. Vinyl wallpaper consists of two layers. The bottom layer is paper or non-woven, which facilitates their gluing. The top layer, made of polyvinyl chloride, is resistant to mechanical damage, moisture and pollution. Very strong, reliable and durable wallpaper. 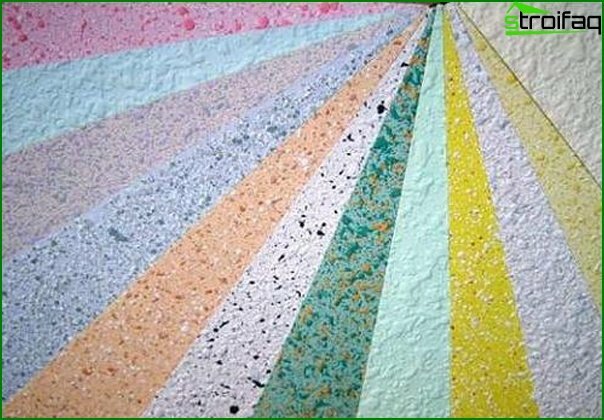 Advantages in gluing: imitate natural surfaces: stone, textiles, textured plaster; Perfectly hide the shortcomings of uneven walls. In the initial form, powdery or liquid. Dilute with water-based paint and applied to the wall. Very practical in the case when with strong contamination of a particular area you can change only it, and do not repair the entire room. Beautiful, durable, easy to apply, natural. Non-woven wallpaper Under painting with imitation of a diverse textureCreate the ground for the flight of your imagination in a color solution and are very practical. Wallpapers can withstand at least five paints, which significantly prolongs their service life. That life was harmonious, the interior of any room in the house should please the eye and create a cosiness. Even if it's a small hallway with a bunch of topClothes and dirty shoes. 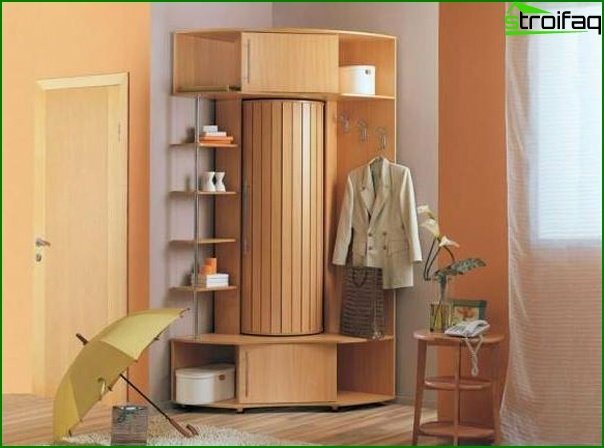 All things can be cleaned in the closet and create an interior that the guests would envy. And the number of square meters does not matter. 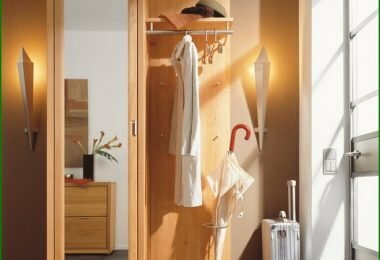 Read more about choosing the right closet for the hallway and other rooms. 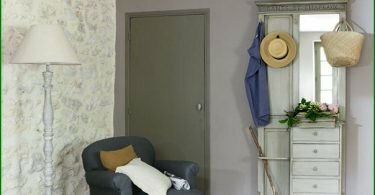 Be sure to find out what trends prevail in the design of the anteroom in 2017 in our article!